Delegates from Algeria, Mauritania and the Polisario separatists are also participating in the meeting held at the invitation of UN Personal Envoy for the Sahara Horst Kohler who seeks to relaunch the negotiation process stalled since 2012. The Moroccan delegation combines official diplomacy, local elects and civil society. It includes Foreign Minister Nasser Bourita, Moroccan permanent representative to the UN Omar Hilale and three Sahrawis. These are Hamdi Ould Errachid, President of the Laayoune-Oued Eddahab region, Ynja El Khattat, President of the Dakhla-Oued Eddahab region (a former member of the Polisario) and Mrs Fatima Adli, a civil society activist & member of the Smara municipal council. These three Sahrawis have been elected in free and democratic elections organized in Morocco’s Southern provinces as in the rest of the country. The voter’s turnout in the Sahara was the highest in the country, according to UN observers. 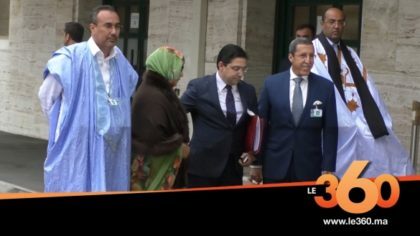 The participation of Ould Errachid, Ynja El Khattat and Fatima Adli in the Geneva meeting along other delegates made the Polisario members feel ill-at-ease because they know very well the separatists’ plots, dirty games and connivance with the Algerian regime. The presence of the elected Sahrawi trio also sends a strong message that the Polisario secessionists are not the sole and legitimate representatives of Sahrawis. The separatists represent only themselves and their Algerian rulers and seek only to protect their own interests. They have lined up their pockets by embezzling humanitarian assistance donated for the Sahrawis held in the Tindouf camps (Southern Algeria) and want to continue to feed on the conflict. After efforts to settle the more than 40-year long conflict failed and as the prospects of holding a self-determination referendum remain illusive while the situation in the Tindouf camps is on the verge of implosion, voices from inside the Polisario have realized that it is Algeria, which is pulling the strings. They have thus joined Morocco to call for direct dialogue between Rabat and Algiers to put an end to the Sahara conflict. According to some experts, the Polisario leaders must compromise to survive as the option of independence is not viable. They say the separatists will not be able to police a vast territory in a region threatened by smugglers and terrorists. They cite in this regard the case of South Sudan that won independence and then imploded in a struggle for power between warring factions. The only remaining realistic option is the autonomy plan offered by Morocco. It enables the local inhabitants to exercise their right to run their affairs themselves, and to achieve integrated development in a free and stable environment.